Increasing U.S. ethanol exports requires building new markets from square one with industry partners and government regulators. This market development work, undertaken by the U.S. Grains Council (USGC) and partners including Growth Energy, the Renewable Fuels Association and the USDA’s Foreign Agricultural Service (FAS), requires time and persistence to achieve huge potential payoffs. 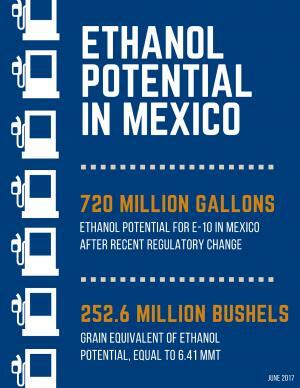 An illustration of this is a recent regulatory change in Mexico, which now represents a potential ethanol market of 720 million gallons, the equivalent of 6.41 million metric tons of corn (252.6 million bushels). On June 15, the Mexican Energy Regulatory Commission, known as the CRE, announced an increase to the maximum amount of ethanol that can be blended in Mexican gas supplies from 5.8 percent to 10 percent, except in the cities of Monterrey, Guadalajara and Mexico City. The announcement modifies the Mexican Official Standard NOM 016-CRE-2016 regarding the quality specifications for fuels by increasing the maximum volume content of anhydrous ethanol as an oxygenate in regular and premium gasoline in Mexico. The Council has strategically focused its promotion of ethanol as the fuel component of choice for a more environmentally-friendly Mexican gasoline that helps reduce greenhouse gas pollution. Those efforts started to see real results in 2016 as the Mexican government began privatizing the petroleum market for gasoline and diesel imports. The Council established a team of recognized scientists that made multiple trips to Mexico to meet with decision makers and educate them on the environmental benefits of ethanol blending. Together with the U.S. Department of Agriculture (USDA) and domestic partners, the Council assisted with two missions to Mexico to find the facts of how and where information was needed and to conduct a technical workshop on the benefits of fuel ethanol use. The first fuel regulation in Mexico to allow ethanol blending took effect on Aug. 29, 2016, allowing 5.8 percent blending by volume outside of the same three major cities. The Council holds a seat on the technical working committee formed after the passage of this regulation, which is tasked with implementation and possible revisions. Last week’s announcement is another positive result of this market development work, but the regulatory change is not the last step needed before U.S. ethanol flows freely into Mexico. For example, the infrastructure necessary to meet the volume of demand that could be in store does not currently exist, which creates a new area of work for the Council, its partners and local industry. In addition, expanding this new regulation to include the three largest cities represents even more untapped potential in the market. Ethanol potential for E10 for these three markets is projected at an additional 480 million gallons, the equivalent of 4.28 million tons (168.42 million bushels). 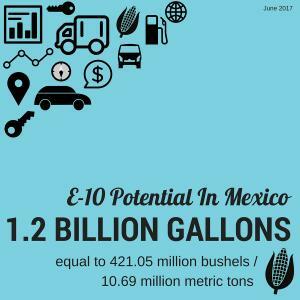 Combined with the rest of the country, Mexico could represent a 1.2 billion gallon market for ethanol, the equivalent of 10.69 million tons (421.05 million bushels). Because of this enormous potential, the Council will continue its vigilant efforts in Mexico to help both build and capture new ethanol demand. Learn more about the Council’s work in Mexico here.